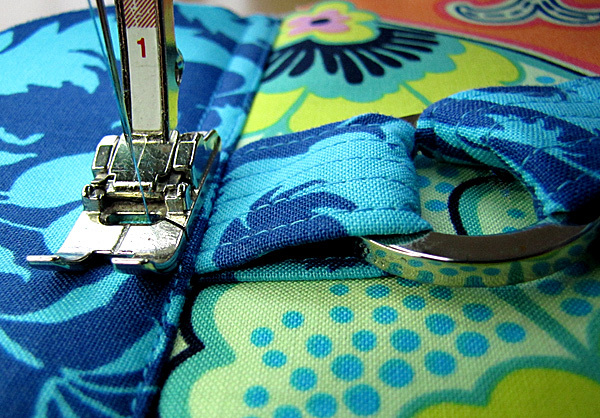 You SEW Girl: To the best of us. If you "like" my business page on Facebook*, you're probably aware that I had a bit of a shock when I saw Lisa Lam's new book recently. It appears that we both came up with the same design idea, quite independently and unbeknownst to one another. They were published around the same time. It happens to designers, especially now that we live in a world where information and design influences spread about the globe like forked lightning. Lisa and I have come up with different solutions for some of the minor things (...and I've rabitted on endlessy about how to make the perfect structured strap with a ring in it, as I'm apt to do...), but the bag shape is the bag shape and a lot of it looks the same. It happens. ...and there's another version of what looks like the wristlet project from my book (albeit a much simpler version, with no pocket, straps or facing, and no wadding in the interfacing mix). I'm quite sure that Sue Kim has never seen my book before in her life (unfortunately, my book is still very difficult to get in the USA). And people wonder why I'm not precious about people using my "designs" to make purses and hats to sell at markets or boutiques or on Etsy...? The key to the patterns that I produce is all in the how-to (and I'm very, VERY precious about that!). Most of the time, I choose to work on fairly simple shapes that are merely the basis for the construction and finishing techniques I want to teach. The simple shapes that inspire me are the same that inspire others; it's how we interpret them that makes the difference. So...in answer to all of you who are polite enough to ask if I'd mind if you use my designs to make things for markets, Etsy or whatever... go ahead. For every polite person, I'm assuming there are a dozen impolite ones and another two dozen who came up with a similar shape without knowing the first thing about my work. I'm thankful if you credit my pattern (and the help it may have given you in your beautifully-finished work! ;) ), but it's not a proviso. I only ask that you put your own unique twist on your interpretation of my designs and feel proud of every improvement in your sewing and design skills. The one thing I'm protective about is the intellectual property I pour into my class notes and instructions. That stuff is hard-earned through years of work, experimentation and making my own mistakes: it's not common knowledge. It's also how I make my living. I have heard tale of people sharing class notes and patterns with friends. Please, please don't do that, especially if you want me to still be here to teach you any more new sewing tricks. In other news, I'm almost certain that I'm headed for another book-case explosion (or a new book case). This is the top shelf of sewing and design collection. The bottom shelves are stuffed full and I've just moved a few boxes of my yarn-based craft books into the studio. Somehow I don't think they'll fit into the current arrangement. And as an addendum to my first point about the influences we share, globally.... how many of these books do you recognise? Homespun is one magazine that I have to buy every month. I have your purse patterns and have made a few as gifts. I'm glad you had a great break away too. Just another example of great minds thinking alike!! Wow. That's amazing how similar those bags are. I bet your jaw dropped when you saw that! I think you need to get yourself swiftly to Ikea or somewhere and get yourself a bigger book shelf before you break that poor little thing. I made this bag the minute I saw it. Being a retro kind of gal - I just had to have it. Finding the magazine was the most difficult task as I'm in the US. Your techniques are always spot on and it's truly a pleasure to work on any of your patterns. Thanks so much for always sharing your talents! you are a good and understanding person. Well done and I love your work. I am likely to say that "great minds think alike". I have completed your Homespun pattern and it was great. I know that if it appears in a publication it will have it's own unique "Nicole" spin. As I said on FB I've made both and will send you the info when I get more organised. I also just bought the Sue Kim book a couple of weeks ago but I'm considering sending it back as it had a lot of very similar ideas in it and nothing really new. As for the books on the bookcase , ah I do love looking at other people's books lol. I recognise and own quite a few - Lisa Lam's book, Stitch by stitch, Collette. Sew U, the fashion construction book, patternmaking for fashion design, sew u home stretch and the fat little handbag book on top. Less drooling over the books and more sewing is in order for me! Hi Nikki, Thank you for choosing your job and creating such fantastic instructions for us technically challenged sewers, you are so appreciated. The same happens with my other field, being jewellery, you make something then see it somewhere else and then I sort of don't show my item as people will think I have copied. It is just all those ideas that now float around on a global scale. Someone else has a very similar product? Certainly it's nothing to stress about. It's really simple - if you have the same set of requirements for a bag, there are bound to be similarities in the solutions! a bag is a bag is a bag, and the ideas have been kicking around civilisation for longer than you or I have been alive. Even so, it is the details that make it yours - it's not only your fabric choices, it's also the method of construction, and how you explain that in your instructions. So many good points in there Nikki - especially when it comes to sharing of property and who 'owns' what. I feel annoyed when people claim simple things like a pillowcase dress or basic pants pattern as their own property, I feel your stuff is different though and I think it's lovely if people would acknowledge your pattern in the construction of an item.